Having seen what leotard options were on offer at our local gymnasium, (and gasping in horror at the price and glare) I quickly steered the girls away, promising them a me-made version very soon. Personally, I think t-shirts and shorts are perfectly adequate gym wear for four and six year olds, but when everyone else is in shiny pink leopard print spandex, I felt a bit miserable sending the girls along in their grey cotton tights. Luckily, I had a great remnant of floral swimsuit lycra in my stash. It was a remnant I purchased from Tessuti last summer. 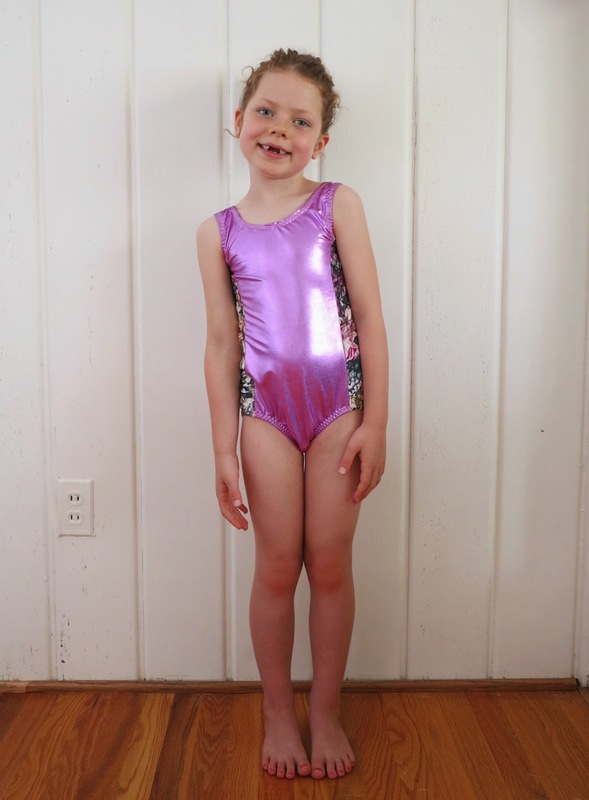 I paired it with a little big splash of metallic spandex from Mood and chose the simplest leotard/swimsuit pattern I could find, Kwik Sew 2724. I’ve sewn a couple of Kwik Sew swimsuit patterns up now (here and here). Both times I found the body length of the design to be incredibly short. Knowing this, I started out with a size 7 and lengthened it in the body by 1″ before I started. 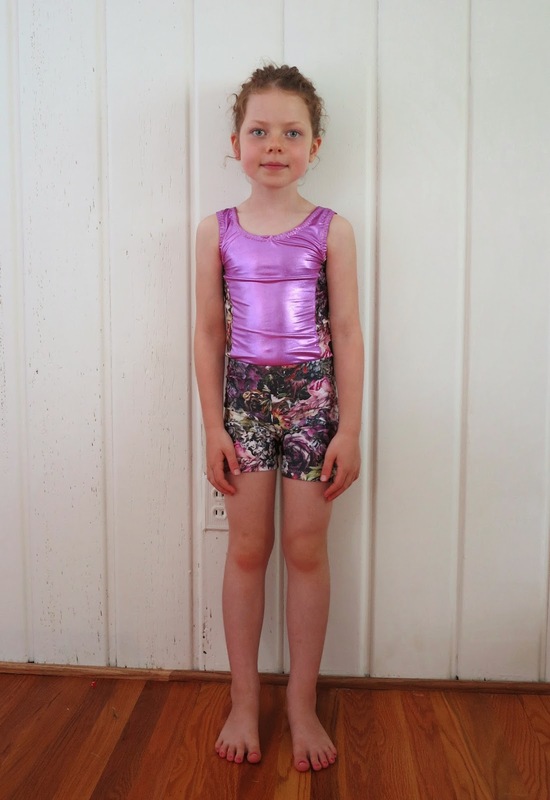 The end result is a leotard that is quite clearly too big for my tall Miss Six. She’s not too fussed though. The width is ok and it seems comfortable enough on her without gaping immodestly. It just has a lot of unsightly wrinkles, particularly at the back. I probably should have just sewn a straight size 7, but I’m wondering if I should have also made a sway back adjustment and narrowed the bum width a little. I also bungled the neckline a little. For some reason, I thought the back was the front when I was attaching the elastic, so the slightly warped starting point of attachment is smack bang in the centre front of the neckline. Really, I should have hidden that point under the shoulder seam anyway. I’m also not sure I love the look of that zig zag stitching, or maybe it is the metallic spandex that shows up every glaring mess you make. I made the bike pants up in a straight size 6 with no adjustments. I ignored the elastic waist guide because it is easier and more precise to simply measure the child you want to fit! These bike pants are actually awesome. They fit her PERFECTLY and took a whole 15min to cut AND sew up. I might make them in some longer versions in winter. This entry was posted in Kwik sew 2724, leotard, metallic, Mood, shorts, spandex, swimwear, Tessuti Fabrics on May 31, 2014 by Debbie Iles. Oh I love it! 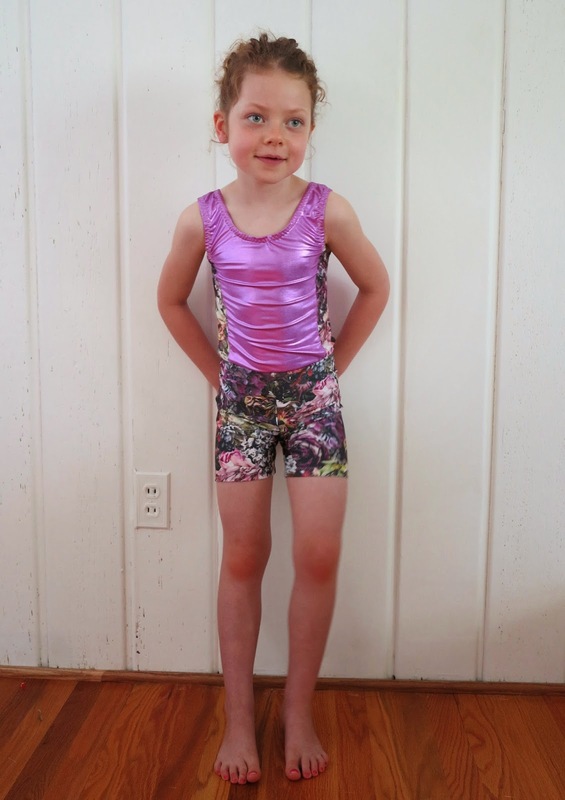 Miss Six looks fabulous in her flashy new gym gear! First day wearing it today. She thinks she’s pretty hot stuff. looks great! 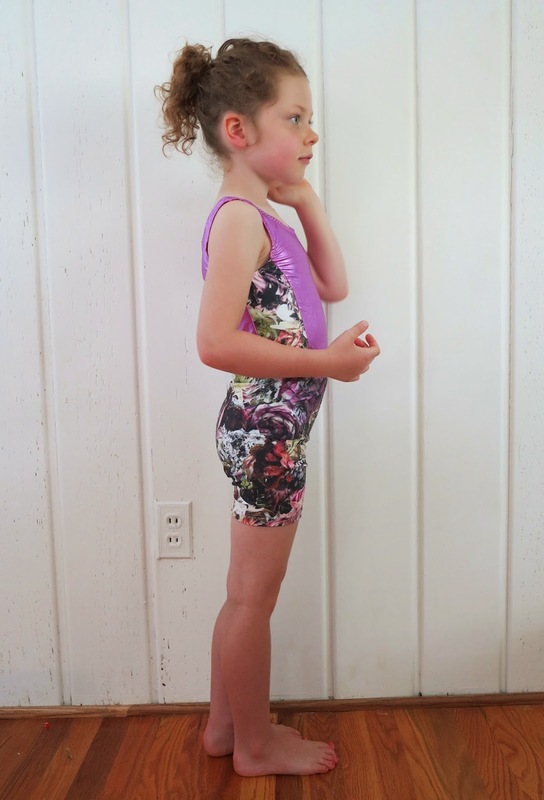 my girls will need new dance leotards this fall… it’s a crime the price they charge for them. no doubt i’ll be making a few!